Successfully Added Balance Board for Wii Fit to your Shopping Cart. Balance Board for Wii Fit. Enjoy a variety of entertaining games involving running, jumping, skating and snowboarding. Play Wii games with all the fun, excitement and energy they were meant to be enjoyed in! Designed for use with the Nintendo Wii console, this standalone product is an incredibly fun wireless board that accurately measures your body distribution across the surface of the board using pressure sensors. The board is perfect for the Wii Fit game, which has sold million of units worldwide, and other compatible Wii console games. This board will provide many hours of fun for you, your family and your friends. This innovative accessory is simple, fun and a great way to get off the couch, keep fit and have fun. Stable and precise, the pressure-sensitive balance board is able to measure your weight and how it is distributed over the board to accurately represent your posture. And to do the original Nintendo Wii Fit Balance Board one better, the CVSN-G41 has four corner LED lights to light up to the action. If you have no time for the gym, then exercise in the convenience of your own home! This board is great for a range of fun fitness activities including yoga, balance games, strength training and aerobics. Combine fun and fitness with this Balance Board for the Nintendo Wii. Resellers: this product will be a hot demand item everywhere because of the immense worldwide popularity of the Wii Fit console game. Customers everywhere need an additional board to add to their system so they can allow others to share in the excitement or simply as a new or replacement Balance Board for their Nintendo Wii video game console. Stock up now to satisfy your customers orders! Ergonomically designed for safe use by the whole family, whether young and old. Please note: This Balance Board for Wii Fit requires a Nintendo Wii console and compatible games to play. 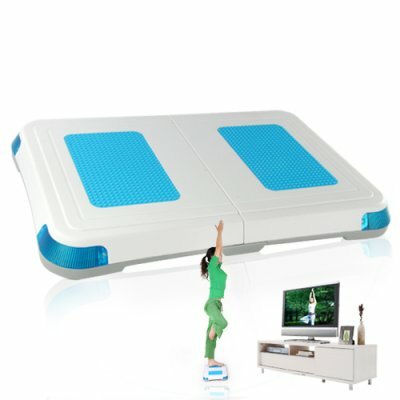 Is the Balance Board for Wii Fit wireless? Yes, the Balance Board is completely wireless.